Set the stage for us: what is Never Break the Chain about? 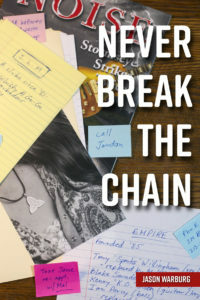 I can’t say it better than I did in some of the promo copy you may have seen: Never Break the Chain is a story about families—the ones we’re born into, and the ones we create. 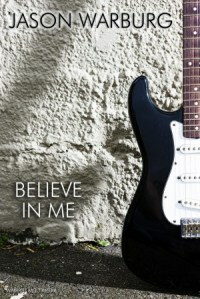 In the first Tim Green story, Believe in Me, Tim is grieving for his father, a music writer who raised him as a single parent and was everything to him growing up. In that story, he’s essentially adopted into a substitute family in the form of a stadium-filling rock band fronted by Jordan Lee. Never Break the Chain answers the biggest question left unanswered by Believe in Me: what ever happened to Tim’s mother, who met his father at a Bob Seger concert on New Year’s Eve and disappeared from his life soon after he was born? The answer involves another deep dive into the music world, visiting both the mansions and the sketchy clubs that populate the hills and valleys of that landscape. At the same time Tim is trying to retrace his mother’s footsteps from 25 years before, he’s drawn into the inner workings of a literal rock and roll family—a past-their-prime arena rock band whose controlling leader, Blake Saunders, has just installed his uncontrollable 18-year-old son Mal as the group’s new lead singer. The stories of these two families—Tim’s and the band’s—unfold and reflect back on and amplify one another over the course of the book, and help bring into focus the two fundamental questions it explores: What does it mean to be a family? And who is Tim Green? What was the initial spark that led you to write Never Break the Chain? There were two things, really. Finishing and then publishing Believe in Me was satisfying in the sense that I set out to tell a story that I was excited about, and told it as well as I was capable of, and felt pretty good about the end result. But I also discovered after I was done with the whole “birthing” process of that book that I missed the characters. I enjoyed writing from Tim’s perspective and was curious to see what might be in store next for Tim and Jordan in particular, who go through so much in Believe in Me. The second thing was that in telling the story of Believe in Me, I very purposefully sidestepped a major thread in Tim’s backstory that I recognized could have taken over that book if I had let it: what happened to Tim’s mother? She shows up for one page in Believe in Me and then disappears from his life for good. At one point I questioned whether Tim’s lack of curiosity about what happened to her after she left him with his father was realistic, but I’ve learned over the years that each person’s sense of “normal” is based on their own context and experiences. “Normal” for the child of a circus performer involves growing up around clowns and fire-eaters and moving every week or so. To Tim, “normal” was being the son of a single dad who doted on him but avoided any conversation, ever, about his mother. Once I started thinking about paths I might explore in another Tim Green story, it seemed obvious that peeling the lid off that particular psychological can of worms would offer some incredibly rich and compelling story material. Tim’s efforts to track down his mother also gave me a chance to play a little in the “mystery” sandbox, where I’ve always been a fan. That description feels like the story has elements of both the family drama and mystery/thriller genres. Well, yes. I happen to enjoy both of those genres a lot and think they are great vehicles for telling compelling and emotionally rich stories. You’re often seeing characters at their extremes in those contexts, and that tends to bring out a lot. I might have tried my hand at a mystery/thriller by now if I had any background in or any of the necessary technical knowledge about law enforcement or espionage or weaponry or any of that, but I don’t, and I’m a lazy researcher. So I write about things I’m familiar with: complex family relationships, and the music world. And then I try to inject elements of the mystery/thriller genre into the mix, such as keeping secrets while leaving clues for the reader, and building to a big reveal. I have to say also that, as a writer, I really hate the whole genre game. I realize that’s a very impractical stance in terms of the marketplace for novels today, but it’s how I feel. Stories are stories are stories. Trying to fit them into neat little descriptive slots is a market-driven corruption of the creative process that can only lead to the homogenization of storytelling as authors try to push their irregularly shaped story pegs into perfectly round marketing holes. I don’t write stories for genres or markets… I write them for readers. When asked to describe the genre Believe in Me falls into, I have generally answered “musical fiction”—e.g. novels about or set within the world of music. That’s the best description I’ve come across so far of the kinds of stories I like to write. What is it about the music world that you find compelling, that makes you want to write stories set in that world? First of all, because it’s so alien to the vast majority of the reading population. 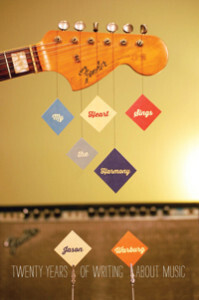 The music world is a foreign country all its own with a unique set of customs and values and norms and its own insider culture and lingo. One of the things the writers I enjoy most do is expose readers to a world that most of them aren’t familiar with, that’s outside of their everyday frame of reference, and act as a tour guide while exploring it. I want to try to do that for readers, because those are the kinds of stories I like to read myself. Second of all, because aside from family and friends and writing, my greatest passion is music. It resonates with and elevates and sometimes even thrills me in a way that I have struggled for much of my adult life to describe adequately, though I’m hoping I got reasonably close to doing it in My Heart Sings the Harmony. It’s a world I’ll never truly be a part of in real life—I still can’t play a note myself—but one that I inhabit often in my daydreams. When you were working on Believe in Me, were you thinking you might write a sequel someday? Honestly, no. Believe in Me was always intended to be a standalone novel and I think it stands up and is complete on its own. But it didn’t take long after the book was published for me to start speculating on how I might be able to make Tim Green the focal point for other stories. Part of what makes Tim Tim is that he’s a keen observer; he notices things. And that’s a desirable trait in a narrator. He’s also deeply flawed in what I think are interesting ways; prone to addiction and keeping secrets, yet also obsessively curious, very contained and autonomous until the emotional floodgates open, and then, watch out. Also, while Tim is generally a keen observer, he doesn’t catch everything. Sometimes he misses things that have been more or less staring him in the face. That can be revealing in a different way. Once my imagination started going off in the direction of another Tim Green story, I had to ask myself: am I writing a series? And my honest answer right now is: I don’t know yet. I can tell you that the story idea I’m currently wrestling with doesn’t center around Tim Green or anyone else who appears in either Believe in Me or Never Break the Chain. And yet, one of the first things I did is figure out what threads of the story I have in mind might connect it to and ground it in that same world. I like the idea of a fully realized fictional world in which characters from different books may bump into each other. Scott Turow does this especially well in his novels, focusing on a new main character almost every time, but setting all of his stories within the same fictional universe, and allowing his various protagonists to cross paths in small, unexpected, and often charming ways. Stephen King, Robert Crais and Michael Connelly have all done this sort of intersectional story-telling with their characters and settings as well, and I find it really appealing as both a reader and a writer. Do any characters from the first book besides Tim return in Never Break the Chain? Yes—while the story centers on a new set of characters who Tim spends a lot of time interacting with, familiar faces from Believe in Me pop up throughout the story. Tim’s childhood pal-turned-romantic-partner Terry Valenzuela is back, of course, with a bigger role this time. His father Bernie Green once again appears in flashbacks, and there’s a scene with his Aunt Ruth. While Jordan Lee isn’t a focal point of this story the way he was in Believe in Me, he plays an important supporting role, and his presence is felt even in scenes in which he doesn’t appear. Finally, Ray—well, you’re just going to have to read the book to find out where he figures into things. Believe in Me included a strong thread of politics as Tim departed that world and immersed himself in the world of music, only to turn back around and take an opportunity to square up the books on his political career. Are politics part of the story in Never Break the Chain? No. Tim exited that arena in Believe in Me, and burned nearly every bridge to the ground on his way out of town. To put it in movie/TV scripting terms, the “A” story in Believe in Me was the Tim’s exit from politics and dive into the music world, and the “B” story was mourning his father and working himself out of the emotional quicksand he’d fallen into since his death. In Never Break the Chain the two main threads (I wouldn’t call either A or B… they’re co-equal and to some extent intertwined) are Tim’s search for his mother and his immersion in a different kind of rock and roll family, one that actually includes a second generation in the form of Blake Saunders’ kids Mal and Jane. The other comment I would make is that politics in the U.S. right now is so far off the rails that I think it would be hard to write credible fiction about it. I’m watching House of Cards Season 5 right now and plot threads in that series that used to seem outrageously over-the-top now feel rather tame. I mean, Underwood is supposed to be such an uber-villain, but I haven’t yet seen him draw a moral equivalency between Nazis and the people protesting against them. I’m also as acutely aware as those House of Cards writers of the impossibility of staying ahead of events when things are moving as fast as they tend to in that world. In the original plot I had in mind in 2002 when I first started writing the story that became Believe in Me, Tim’s revenge on his old boss Frank Cassini involved recruiting Jordan Lee to run against him, in that iteration in a race for governor. The novelty! A non-politician celebrity running for and possibly being elected governor! Then California elected Arnold Schwarzenegger governor in 2003 and I put the book aside for four years out of sheer frustration at getting scooped by reality—which is, indeed, stranger than fiction. This is your second Tim Green novel. Will there be a third? The future is tough to predict. As I mentioned before, the next novel that’s been coming together gradually in my mind over the past several months doesn’t focus on any of the characters we know so far in Tim’s universe—but it does take place within that universe. I can tell you this—I won’t write another Tim Green story just because it’s fun writing from his perspective. There would have to be a really good story to tell, with big stakes and the opportunity to further evolve Tim and company’s characters, and challenge them in ways they haven’t been challenged before. We’ll see.